Sold by Carta Diem and Fulfilled by Amazon. 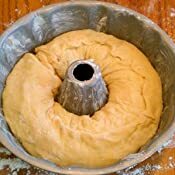 More and more people are rediscovering baking bread from scratch at home. All you need is an expert book with failsafe tips to get you through your first experiments with yeast and "turning" the dough, and Nick Malgieri's Bread provides you with just that. 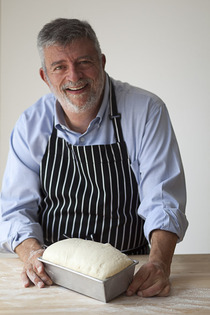 Working from the essential first building blocks of ingredients, equipment and techniques and taking you right through to the accomplished heights of slow-rise, two-step, and sourdough, this is a masterclass from a master baker. With additional recipes for showcasing your beautiful bread, like Sicilian Pasta with Breadcrumbs, Calzone, Empanadas and a Total Heaven Chocolate Almond Cake, this is the bread baking bible to turn to again and again. Sold by Carta Diem and ships from Amazon Fulfillment. Nick Malgieri is currently director of the baking program at the Institute of Culinary Education in New York City. The author of 9 cookbooks, Nick is a contributing editor for Desserts Professional and a frequent contributor to Saveur. I don’t know about you, but I get tired of reading over-exaggerated marketing hype. So, one thing that I appreciate about this book is the honesty and modesty of its claims for itself. For prospective customers, one of the best things that you can do is to check out the “Look Inside” feature which will afford you the opportunity to read the back cover of this book. I believe it to be about as accurate of an overview as you will find. I placed my order for this book on Amazon before its release date of October 16, 2012, so this review is being written with over two and a half years of perspective. Before purchasing this book, the only other book that I had from Malgieri was “How to Bake”--which didn’t really make much of an impression on me. Still, I bought this because I was trying to build up my collection of bread baking books. The photography and food stylist work are both first-rate. It’s really fun to browse the photographs and dream about making breads from this book. 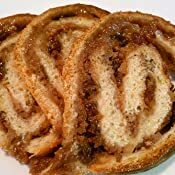 I think that “Nick Malgieri’s Bread,” as well as the Hierloom Baking and Cooking books by the Brass Sisters, are all excellent for scheming about making mouth-watering offerings. I didn’t fall in love with this book right away. It took some time for me to really understand that Malgieri’s vision wasn’t just to make a loaf of bread--but rather to make it as a component of a tasty meal. Once I understood the larger vision, I knew that it was a journey that I wanted to take. This is a nice place to start for new bread bakers that doesn’t necessarily require a big investment in equipment. There are a fair amount of recipes that use standard items that would be in any kitchen. This has made it a great book for me to take along on vacation when my wife and I have rented a vacation house for a couple of weeks. Ultimately, if you become devoted to bread baking, you will probably want to invest in better gear. For instance, it’s hard for me to imagine getting along without a dough proofer and a heat lamp, but they are not absolute necessities for this book. Most of the time, I don’t feel like I’m working all that hard when baking from this book. If your life gets busy, it can be a benefit to have some easier bread baking books to work with, and then you can leave the advanced books for when your schedule permits. I don’t think it’s an accident that Malgieri has written a lot of books. He seems to have his act together as an author because I’ve found very few mistakes so far. He’s built up a lot of connections in the industry, and there are many examples of recipes shared from notable colleagues. The repertoire in this book is quite diverse. Malgieri’s ethnicity is Italian, and so his strong suit is Italian breads and dishes. I’ve found his rye breads to be something of a mixed bag. I haven’t enjoyed all of them, but some have been well received here. There is a good mix of responsible offerings as well as decadent ones. I went through a period when I was being aggressive in baking the decadent ones frequently--and having quite a good time doing it, I must say! Subsequently, my wife started referring to this book as “that evil baking book.” After I eased up and used more common sense, she stopped referring to it that way. She recently made the onion marmalade recipe from this book at her own initiative for company, so the damage was only temporary. She eventually stopped referring to the book that way once she got her point across to me--and I listened. Malgieri writes on page 7: “I’ve written explanations for how and why the steps in the bread-making process work the way they do, relying on experts who provided scientific information that I then expressed in simple and easily understandable terms. Baking a loaf of bread shouldn’t have anything in common with studying for a biochemistry exam. 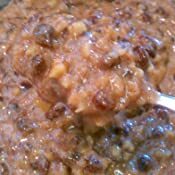 Using these recipes, you will make delicious homemade bread with a minimum investment of today’s most precious and scarce commodity: time.” I think that he has largely succeeded except in the case of making a sourdough starter. I already had a functional starter before purchasing this book, so I tried his method mostly out of curiosity, knowing that I was planning on reviewing this book. Unfortunately, I’ve had repeated failures with the procedure. Malgieri does offer an alternative of purchasing an already viable starter over the internet. I think that would be my recommendation for you. 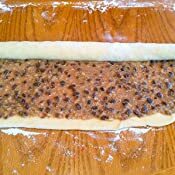 If you really insist on trying to create your own from scratch, you may want to consider directly substituting whole wheat flour for the dark rye flour if you cannot get his instructions to work. I believe that substitution will take you on a more direct route to establishing a starter that is ultimately based solely on wheat flour. I found that Malgieri’s instructions for maintaining a sourdough starter--once it’s going--is acceptable in a pass/fail sense, and I’ve enjoyed some of the sourdough recipes here. In boxing, there are different divisions such as lightweight, middleweight, heavyweight, and so forth. On Amazon, they provide sales rankings for all bread books lumped together without distinction. If this book claimed to be competing for the heavyweight championship of bread baking, then I’d have a problem with that. But, that’s not the case. I think that book is honest about itself, and I can accept it for what it is. I feel that it has earned a special place in my bread baking library, and I enjoy baking from this book. Notes: I've uploaded a number of pictures into the image gallery. At this time, they do not seem to be linking up with my review, but when they do I expect that the individual captions will be lost. So, I'm saving the caption information as a note in the review for when the links are established: Sub Rolls (p. 82) are a variation of the Teleras / Mexican Sandwich Rolls; slices of Part Whole Wheat Sandwich Bread (p. 64); Hamburger Rolls (p. 81) that were made in a modestly stocked rental vacation home; braided Challah or Jewish Braided Sabbath Bread (p. 186) with sesame seeds substituted for poppy; Fig and Almond Bread (p. 32) is suitable for beginners, and it involves minimal time and effort to get flavor; Soufflee Toasts (p. 142); Italian Snack Sandwiches (p. 69); My Father’s Tomato Sandwich (p. 70); Focaccia (p. 160) with potatoes, gruyere, seasoning and onion marmalade; Grilled Gouda & Bacon Sandwich (p. 137); two loaves of Golden Sandwich Bread (p. 60); Mozzarella in a Carriage (p. 134) using Pain au levain (p. 130); 3 slices of Multigrain Sourdough Bread (p. 152); a boule of San Francisco-Style Sourdough Bread (p. 131); Croque Monsieur sandwich (p. 136); and Sourdough Scones (p. 133). In 1985, when I turned 40, I quit my corporate writing/editing job in NYC to attend cooking school full-time and embark on a culinary career. Nick Malgieri was the pastry and baking instructor in that school at that time, and I happily became one of his adoring disciples. I reviewed his first cookbook in the James Beard Foundation newsletter in 1989. Now here we are, decades and ten cookbooks later, and I'm still a devoted fan. 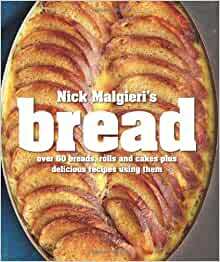 Nick's newest book, on bread, is his best baking cookbook to date. The recipes are so clear and appealing and the dazzling photographs so true to life, I keep trying to brush the (pictured) crumbs off the page. Now that I teach bread baking in the culinary arts department of our local community college, I'll be using Nick's book as our text. I, too, own numerous bread books, but this one is the best by far. I have to admit, I have a bias towards any Nick Malgieri book. As with his other books, this one has great recipes and lots of useful information. I like the fact that the recipes are written in both volume and weight. I also like that each recipe has a "Quick Change" box which gives you some interesting substitutions. The book also has recipes for things to do with bread like meatloaf, bruschetta and unusual sandwiches. I have many baking books, from the most basic to advanced books with scientific formulas for baking bread, this book is a great "in between" addition to my collection. you will not believe how easy it is to make your own bread at home with this book! I dabble around with bread making, and love the smell of baking bread. I use a bread maker from time to time, but find the flavors of slow rising bread more complex (and lacking the bread maker paddle holes!). While perusing cookbook reviews, I ran across Mr. Malgieri's Bread, and decided to take the plunge. So happy I did, every recipe has been marvelous! The olive bread had a friend commenting that she felt she was dining in a great restaurant. I am determined to learn to bake a decent loaf of bread, and have bought bread cookbooks before. This is the best one I've encountered yet. I've only had time to try a recipe from it once, and it turned out perfectly, a nice simple basic loaf of white bread. I'm sure I'll have a lot of fun with this book. It's perfect, step-by-step and gives reasons for each step in the introductory chapters. A good read and a good tool. I have most of Mr Malgieri's books, and love them all, but this is the first that has entree food too, not just breads and desserts. It is great to read recipes from him on other topics. What I especially like about this collection is that he makes soughdough bread, which always seems too scarey to try, seem possible even if you don't live in San Francisco. His recipes are always clear and work perfectly. I can't wait to follow him for a whole meal. I'm a huge fan of Nick Malgieri and this latest book of his did not disappoint. It's a beautiful book with great photos, and recipes I know I can count on.